Wettest year on record – official! As if we didn’t already know, it’s now official. England has suffered the wettest year since records began, with the UK as a whole likely to follow suit. 43.1 inches (1,095. 8mm) of rain fell between 1 January and Boxing Day, the Met Office said. The wet weather has caused havoc for long distance walkers this year, including those on A Dales High Way, who on the whole have enjoyed their walk despite the downpours. And we may have to get used to more wet summers like this, according to a study by scientists from Sheffield University. According to Dr Hanna and an international team of scientists, melting summer Arctic ice may be weakening the jet stream, leading it to meander and become slow moving. If the jet stream - a ribbon of strong winds high up in the atmosphere - is weaker than normal, then it can be deflected southeastwards towards the UK, resulting in the wet, cool, unsettled conditions that we have seen since 2007. The increased arctic melting is a result of global warming. See Sheffield University report here. See our previous posting here. A 3-year project to enhance, promote and preserve the unique upland watershed landscape of the South Pennines has won the UK Landscape Award for 2012 and will go forward to the European awards next year. The area covered by the project includes Rombalds Moor, crossed by the first leg of A Dales High Way. The South Pennine Watershed Landscape Project includes a number of smaller community-based projects covering archaeology, conservation and art. Volunteers have helped catalogue the prehistoric rock art of Rombalds Moor, survey the former coal mines of Baildon Moor and create a sculptured poetry trail across the moor. See our previous posting here and the Watershed Landscape website here. Walkers in the Yorkshire Dales are understandably concerned at the potential impact of chalara ash dieback disease on the landscape. 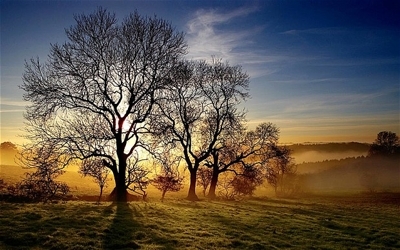 Ash trees are widespread in the Dales and are a feature of many woodlands. They often form the major canopy tree in limestone areas. They can also be found in hedgerows and as scattered individuals. A testament to the species' local significance is in the meaning of several village names such as Askrigg in Wensleydale, which means the ash tree ridge, and Eshton near Gargrave, which means the farmstead by the ash tree. Geoff Garrett, the YDNPA’s Senior Trees and Woodland Officer, said: "Ash is such an important tree in the broadleaved woodlands of the limestone uplands of the Yorkshire Dales that we are treating the potential impact of the disease very seriously. "If the disease were to take hold in the National Park, it would irreversibly alter the character of our woodlands which in turn would have a dramatic effect on the landscape, altering it forever." Latest findings (Nov 22nd 2012) are that 257 areas of ash die back have been confirmed in the UK – 17 nursery sites, 105 recently planted sites and 135 established woodland. Although none are in the Dales, infection has occurred near Leeds, as well as in North Yorkshire and near Appleby - the end of A Dales High Way. The Yorkshire Dales Millennium Trust, who plant acres of young trees every year in the Dales are anxious to point out that the countryside is not closed. National Tree Week (24th November to 2nd December 2012) marks the start of the tree planting season, and between now and April they hope to facilitate the planting of approximately 112,000 new native broadleaf trees across almost 20 sites. Species planted will include Oak, Hawthorn, Blackthorn, Downy Birch, Alder, Rowan, Bird Cherry and Goat Willow – no Ash trees are currently being planted. Anyone wanting information about ash dieback is asked to contact the Forestry Commission’s Forest Research Tree Health Diagnostic and Advisory Service on 01420 23000 or visit the Forestry Commission website here. A new section of the iconic 24-mile Three Peaks Challenge route in the Yorkshire Dales National Park is now open for business, bringing an end to a horrendous stretch of bog-yomping. Work started earlier this year to create an alternative path from Pen-y-ghent to Ribblehead that would avoid the badly-eroded Horton Moor and Black Dubb Moss area. The Park Authority’s Three Peaks Area Ranger Steve Hastie said: ”The feedback we have had so far about the new route is very positive. It also provides an alternative way to Horton-in-Ribblesdale for Dales High Way walkers who are adding Pen-y-ghent to their walk. A €30,000 grant for the project came from the European Outdoor Conservation Association (EOCA) after a public poll of several schemes. 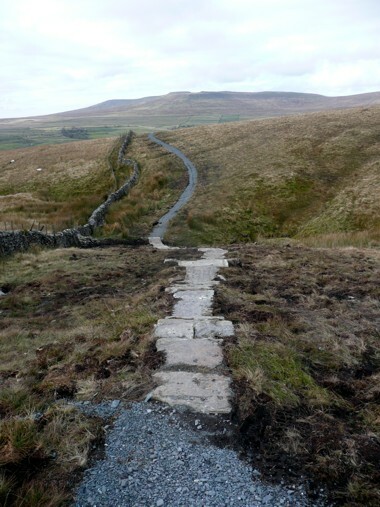 National Park Rangers and Dales Volunteers used 650 tonnes of materials to link up two existing stone tracks that are both part of the Pennine Way National Trail to create the alternative route, which includes three sections of stepped stone flags and a small footbridge across Sell Gill Beck. The Authority’s conservation experts hope that, by diverting walkers away from Black Dubb Moss, it will give the sensitive peatland habitats and the damaged vegetation time to recover. See our previous story here. See the updated Three Peaks Challenge Route maps and info here. Friends of A Dales High Way are teaming up with the Yorkshire Dales Society to put on a guided walk for next year’s ride2stride – the second Settle-Carlisle Walking Festival. And they plan to follow in the footsteps of the famous composer Elgar – who had close links with the area. Edward Elgar was born in Worcestershire in 1857 and is probably best known for compositions such as the Enigma Variations and Pomp and Circumstance. What isn’t so well known is his love of the Yorkshire Dales. 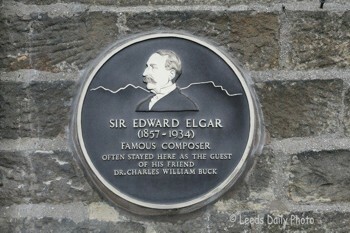 Elgar met Charles Buck, a doctor from Settle when they were both young men and regularly visited him in Settle and Giggleswick. As well as music the two men shared a love of the countryside (and dogs) and regularly walked together from Settle over Giggleswick Scar to Feizor then on to Stainforth before climbing up to Catrigg Force and returning to Settle – a round trip of over 13 miles which is now known as the Elgar Way. Local historian and former editor of the Dalesman Bill Mitchell has written about Elgar’s links with Craven and in his research uncovered a box of letters from Elgar to Buck and some forgotten scores which he had written at Giggleswick and stored in the case of a grandfather clock at a Lakeland farm. Bill writes: “A visit to Giggleswick in 1888 was particularly productive of music. Several interesting scores were signed and dated as from Giggleswick (one from ‘Giggleswyke’)”. Both Bill and Elgar feature in next year’s Settle to Carlisle Walking Festival – ride2stride - which runs from April 30 - May 6. Bill is giving a talk about the building of Ribblehead Viaduct and walk leader Chris Hartley is leading a walk on the first half of The Elgar Way, cutting it short at Stainforth Force and returning to Settle along the route of A Dales High Way. Our very own Chris Grogan will be assisting. Meet at Settle station at 9.50 am on Bank Holiday Monday, May 6th, for this 8-mile moderate walk. See the ride2stride website here, and the Yorkshire Dales Society here. Footpaths in the Three Peaks area, including sections of A Dales High Way, have been given a £450 cash boost from book sales and pub meals. 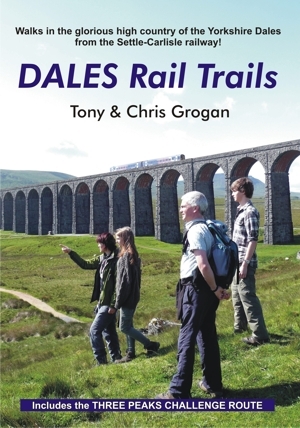 Tony and Chris Grogan from Saltaire-based publishers Skyware Press decided that a proportion of the proceeds from the sale of each copy of Dales Rail Trails would go to the Friends of the Three Peaks, which is run by the National Park Authority. Chris has passed on a cheque for £200 generated from sales of the book over the spring and summer. The Lion in Settle decided to help by donating 15p every time a hungry visitor to the pub ordered a main course dish called Butchers Board. And manager Ian Pilcher has handed over a cheque for £250 – raised from more than 1,600 meals, for the National Park’s Three Peaks Project. Photo shows from left: Ian Pilcher, Chris Grogan and Steve Hastie. See Dales Rail Trails here, the Lion here and the Yorkshire Dales National Park here. The 3rd Settle Storytelling Festival gets underway on Thursday 11th October, promising an interesting mix of entertainment for visitors and locals alike. A recent survey conducted by the Yorkshire Dales National Park Authority showed that as well as major concerns about the state of the economy and rising fuel costs, Dales businesses want more opportunities to work together on events and promotions that bring more people to the area. Events like Settle Storytelling Festival and Ride2stride, the week-long Settle Carlisle Walking Festival that takes place in the Spring. See the Settle Story festival website here. Vintage cars lined the promenade through Saltaire’s Robert’s Park for the final weekend of the 2012 Saltaire Festival – and the rain (mostly) stayed away! Although organised by the Yorkshire Rover Club the models on display ranged from the tiniest bubble cars to vast American classics familiar from old movies. 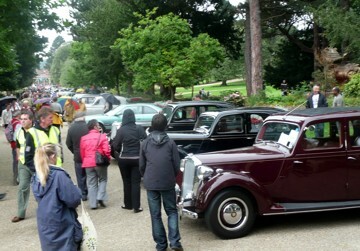 The classic car rally was only one of dozens of events being held over the final weekend of this 10 day Festival. A marquee in Roberts Park, set up by local curry giants, the Aagrah, provided a pop-up Kashmiri Restaurant as well as a demonstration kitchen where visitors could watch celebrity chef Stephanie Moon at work. The Aagrah’s managing director Mohammed Aslam said he was pleased to be bringing some spice to this year's Tenth Saltaire Festival. "Food brings people together," he said, "we'd like everyone to come and have a good time." There was live music on stages in the village and the park, in Victoria Hall and Caroline Social Club and a Continental Market down Exhibition and Victoria Roads. If you’re thinking about walking A Dales High Way next September don’t forget this is an annual event and it might be worth spending a day or two at the 2013 Festival before you leave the crowds behind and head for the hills. See the Saltaire festival site here, and the Yorkshire Rover Club site here. It's official - we've just enjoyed the wettest summer in 100 years. And that follows the wettest Spring quarter since records began. It's been a tough year for walkers everywhere. In general, though, most of the route of A Dales High Way has stood up well. Most walkers this year have still managed to enjoy their long distance walk, despite the battering they've suffered from the elements. But the prolonged rainfall has served to highlight those wet and muddy spots along the way which cause particular problems. So we've taken the opportunity to produce our own Dales High Way Grot-Spots webpage, showing where the problems are, along with a few survival tips on how best to cope with them. So check them out before you set off on the trail. And if you think we've missed one, then let us know. See the Dales High Way Grot Spots here. The Stanza Stones are 6 huge stones, each with a poem carved into the surface. They are situated at intervals high on the moors of the Pennine Watershed and can be visited either as a series of short family walks or in one continuous 47 mile trail from Marsden to Ilkley. 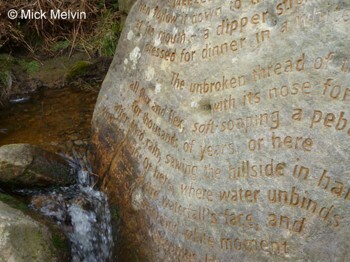 The stones were commissioned by Ilkley Literature Festival in 2010 and completed earlier this year. Each stone took many weeks with carver Pip Hall spending days out on the moors. The poems are all on the theme of water which poet Simon Armitage says gave shape and form to the region. "The water that sculpted the valleys, the water that powered the hours on the moors in all weathers. industries, the water that we all take for granted but is our most precious life-giving substance." The Puddle Stone can be found high on the moor, heading west from Lanshaw Lad, past the trig point, towards the twin Keighley Masts. The other can be found by heading down Wells Road towards Ilkley, and following a path around the Tarn to the wooden bridge over Backstone Beck where the Beck Stone will be found. Apparently there is a 7th stone, a secret one in an unnamed location just waiting to be found. Perhaps that's on the route of A Dales High Way. See Simon Armitage in Conversation as part of the Ilkley Festival, at the Kings Hall, Ilkley on Sat 6 Oct. at 7.30 pm. See The Stanza Stones website here. Dry stone wallers will be putting their skills to the test at a unique competition to be held at Dent this month. One of the most defining characteristics of the Yorkshire Dales is the mile after mile of dry stone walls that crisscross the landscape. Built over the centuries they originally served two purposes, marking field boundaries as well as clearing the land of stone. The network of walls is one of the most eye catching and extensive man made structures within the Dales and their long lasting strength is a testament to the skills of the wallers. There are over 5000 miles of dry stone walls in the Dales and it's important that the skills needed to repair and conserve them are not lost. 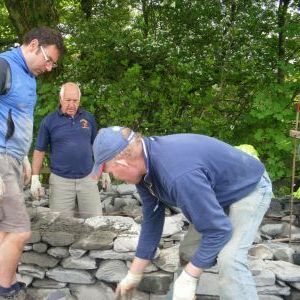 To celebrate wallers and walling Rural Skills Cumbria is holding a Dry Stone Walling Grand Prix this summer. Walkers on A Dales High Way can catch the competition at Dentdale Show on Saturday Aug 25 between 9am and 4pm. There is also the opportunity to see demonstrations of the art, as well as join training sessions. The Dales High Way route around Dent village passes the showfield on a path that it shares with the Dales Way. The Dales Way Association are supporting the Yorkshire Dales National Park Authority in providing prize money for the competition. Update: 24/8/2012 - Alas, the Dentdale Show has had to be cancelled due to the bad weather! However, the dry stone walling competition is still on, so if you're in the area keep an eye out for that. See Rural Skills Cumbria here, and download details of the Grand Prix here. See also the Dentdale Show here. The final section of A Dales High Way, which passes through Cumbria into the Eden valley, has now been waymarked. Countryside officers of Cumbria County Council undertook the work, putting the distinctive waymarks on posts at junctions wherever the route leaves a road, or at other spots where there might be confusion, such as at Bandley Bridge. In between, regular waymarks show the way. Waymarking has now been completed through the areas controlled by Bradford District Council, North Yorkshire County Council and Cumbria County Council. 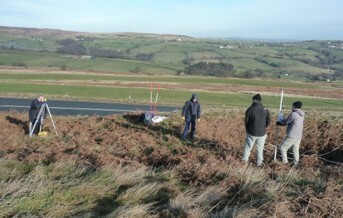 Preparations are underway to waymark the final stretch through the sensitive area of the Yorkshire Dales National Park. Countryside officers completed the work despite heavy rainfall, which has led to flooding along Hoff Beck at the end of the route. However, walkers are now reporting the route as passable, though still wet underfoot. See our previous report here, and more on waymarking here. The Queen took a few tentative steps at the start of A Dales High Way today, before heading into Salts Mill for a lunch. 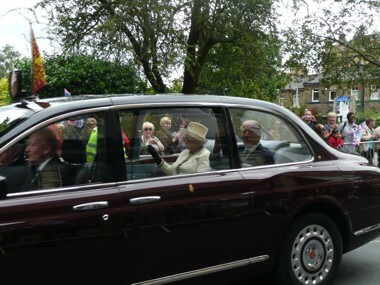 She was visiting Saltaire with Prince Philip and drove down Victoria Road, waving to the crowds who had gathered to see her. A Dales High Way starts in the world heritage village of Saltaire, just outside Victoria Hall. Does this mean the long distance path now has Royal approval? Alas, it is unlikely she is aware that the route exists. Prince Charles though, is known to have a liking for the western Dales. The private visit was a break from the Queen's Jubilee tour. She was visiting Pace Technology, who are based in the mill. The Queen was wearing a Karl Ludwig dress and coat in beige and cream tweed with a matching hat by Angela Kelly. A new link for walkers has at last been established between Newbiggin-on-Lune and Ravenstonedale. 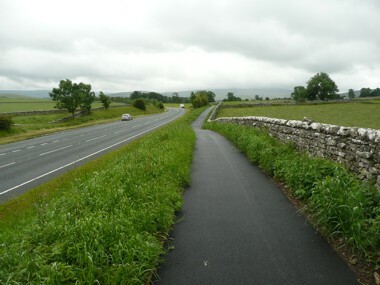 After 10 years of campaigning and fundraising by locals, a new cycle and walk way has been constructed alongside a short stretch of the busy A685, linking the two communities that were split when the road was constructed in the 1970s. Since then, locals have had to travel between the two villages by car, as the main road was unsuitable for pedestrians or cyclists due to the unrestricted speed, and also the long corner where the village junctions are situated. Walkers on A Dales High Way who were staying in Ravenstonedale, or using the alternative bad weather route to the east of the Howgills, faced a tricky quarter mile hike along the road verge. Now the journey is quick, easy and safe. The parish of Ravenstonedale has a small primary school in Ravenstonedale Village, and a pre school nursery in Newbiggin on Lune. The pubs are in Ravenstonedale and the village hall is in Newbiggin on Lune. 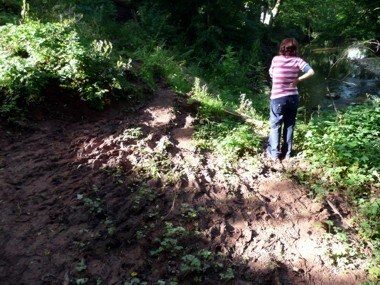 Needless to say this path will be well utilised by all ages in both directions. The path also closes a missing link in a national cycling route from Pendragon Castle to Orton. 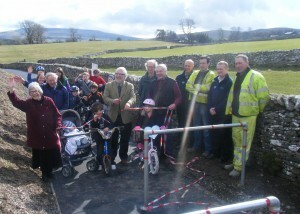 The new cycle and walk way was officially opened on March 10th this year, and is a credit to the people of this small parish. See the Ravenstonedale Community website here. Accommodation in Dent is fully booked for the festival weekend, despite the sudden wet weather prospects. 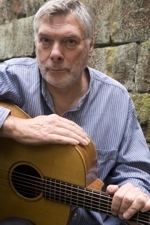 Steve Tilston, Sarah Gillespie and Emily Smith are all appearing. "At this point (Thursday 11.30am) we've only had a few light showers throughout the week and the festival field is set up and we're nearly ready to go. Both festival and camping fields are fairly dry and in good condition at the moment. "The forecast for tomorrow is similar to today, with the chance of rain dropping as we get into Saturday and Sunday so fingers crossed!!" 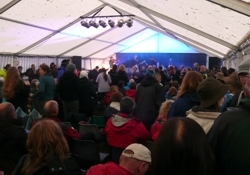 The Dentdale Music and Beer Festival has been running since 2002 and has proved a huge success. This year the free festival has attracted some top performers, including a winner of this year's prestigous Radio Two Folk Awards - Steve Tilston, who has teamed up with Yorkshire based roots quintet The Durbervilles. 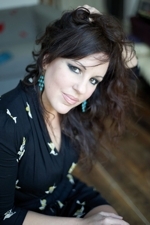 Also performing is the urban-folk sensation Sarah Gillespie and Scottish singer and songwriter Emily Smith, who recently featured on BBC TV's Transatlantic Sessions. As usual the free entertainment runs from Friday through to Sunday, with a wide selection of real ales and wonderful food on offer, as well as the usual impromptu session in the local pubs. Above: Lower fields are flooded. Below: Reel Jiggy pack them out on Friday night. 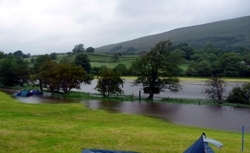 Oh dear, wind and rain hammered Dent through Thursday night and Friday, flooding the lower fields of the dale, flattening some tents and driving other hardy campers onto higher ground. But, the music went on regardless. By Saturday morning things were looking better with the Festival website reporting: "We're pleased to say that conditions have improved significantly overnight on the festival field so everything's going ahead for today." And the mud slide which appeared last year is back again - there's just no way to dampen these festival spirits! See the Festival website here, and last years posting here. Saltaire has been chosen as one of 132 historic world sites to feature in Google's new World Wonders project, alongside Stonehenge, Pompeii and the ancient Kyoto temples. It is one of only two places in Yorkshire - along with Selby Abbey - to be included in the project, which aims to preserve culture online by offering educational resources, photographs, videos and of course Google's Street View, which allows you to wonder around Saltaire as it appeared a few of years ago (the 2008 Saltaire Festival can be seen being set up). Shipley ward Councillor Martin Love said residents should feel "very proud" of Saltaire's inclusion in the scheme. He said: "I think it is a wonderful acknowledgement of Saltaire and all the work that has been done there in recent years and the work that was done 150-odd years ago by Sir Titus Salt building it in the first place. "I hope it will increase tourism locally as well as people from further afield. I look forward to seeing what comes with it." 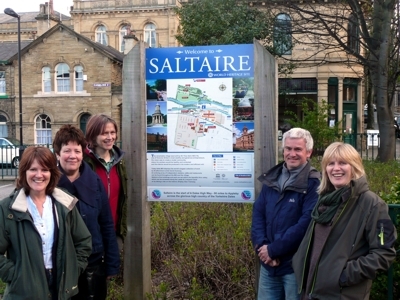 Saltaire is the starting point for A Dales High Way. 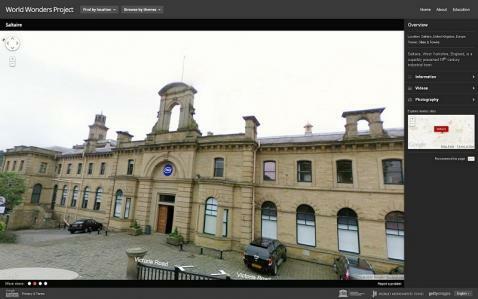 See Google's World Wonders Saltaire site here. Waymarking along the first section of A Dales High Way has now been completed. 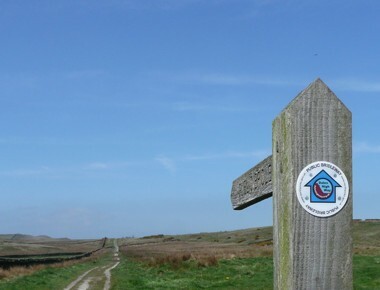 Walkers following the 18-mile route from Saltaire to Skipton should be reassured to find the circular blue and maroon logos at the centre of some traditional waymarks along the way. "This first stage of the waymarking has gone quicker than we anticipated " said Tony Grogan of the Friends of A Dales High Way group, who are behind the scheme. 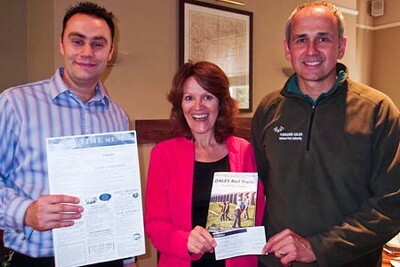 "With luck we're on track to have the whole route waymarked by the start of the 2013 walking season next spring." The waymarking has been agreed in principle by the four authorities responsible for countryside access along the route. "This first section covers land under the stewardship of both Bradford Metropolitan District Council and North Yorkshire County Council, both of who have been very supportive," said Tony. "We also had to get the agreement of British Waterways for a couple of waymarks along the canal at the start." The waymarks are designed both to help walkers navigate the route and to promote the new long-distance trail. But walkers won't be able to follow the route by waymarks alone. "People shouldn't expect to find waymarks on every stile and gate", said Tony, "You'll still need a good guidebook and map to follow the route." See previous posting here. Join the Friends of A Dales High Way here. 28 walkers and 3 dogs enjoyed a Taste of A Dales High Way on Sunday, as part of the hugely successful Settle-Carlisle Walking Festival. 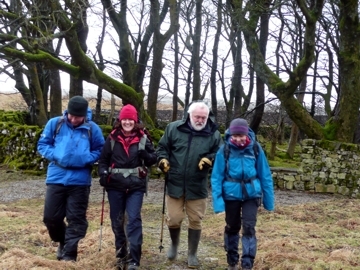 The 10 mile circular walk from Settle was jointly organised by the Friends of A Dales High Way and the Yorkshire Dales Society and led by Chris Grogan. After climbing from Settle, past Jubilee Caves and along the Pennine Bridleway to Gorbeck, the walkers joined the route of A Dales High Way at Langscar, climbing up to Nappa Gate, between Kirkby Fell and Grizedales and down besides Attermire Scar amd Warrendale Knotts. Returning to Settle in good time, after suitable refreshments at the Lion, a group hopped on the train to Ribblehead to enjoy the music on offer at the Station Inn. 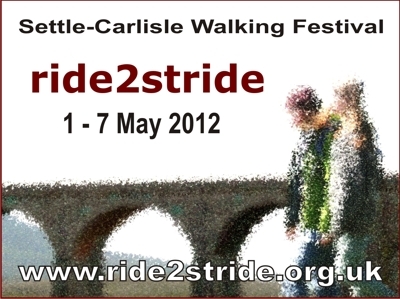 Ride2stride 2012 is the first Settle-Carlisle Walking Festival. After proving such a great success the demand for future events is going to be hard to ignore. Strong winds made for a particularly tough competition in the 58th annual 3 Peaks fell race. Thankfully the rain stayed away for the day, a rare respite in what has proven to be the wettest April on record. And although the sun shone, it was still bitterly cold. With the harsh conditions, no-one was expecting any racing records to be broken. But the first four runners, led for most of the way by Joe Symonds of the Hunters Bog Trotters, still managed to finish the 23-mile course in under three hours. For many others, the tough going took its toll. 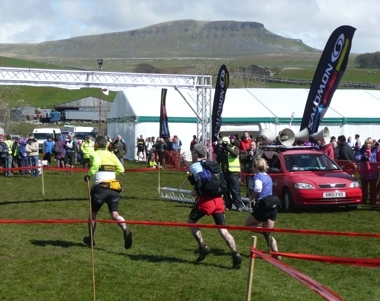 Of the 745 who started, over 100 didn't make it to the finish line at Horton-in-Ribblesdale. This year saw a slight route change on the top of Pen-y-ghent, with runners heading north along the ridge from the summit for half a mile, before dropping west to rejoin the original route. This one-way system was designed to avoid the runners passing each other on the steep western escarpment. Runners reported snow on the top of the summit. The organisation of the event by the Three Peaks Race Association was, as ever, flawless. See the Three Peaks Fell Race website here, and see the full results here. Way marking the route of A Dales High Way has begun with the unveiling of a new sign at the start of the 90-mile long-distance trail in Saltaire. The new sign was designed by Bradford Council and erected at the entrance to the car park on Victoria Road earlier this month. Julia Pearson, chair of the Friends of A Dales High Way, said: "We're delighted with the new sign and grateful to Bradford Council who have been very supportive of the Dales High Way project from the beginning. We are now ready to start way marking the first stages of the route." The Friends have raised the funds for the way marks and obtained the agreement for a design with all the authorities responsible for those areas which the trail crosses. Positioning of the way marks for the first stages has also been agreed with officers from Bradford District Metropolitan Council and North Yorkshire County Council. Over the summer volunteers will put up the way marks between Saltaire and Skipton. "We still have to finalise a timetable with the Yorkshire Dales National Park Authority and Cumbria County Council, but we expect that the way marking of the entire route should be completed by the end of next year," said Julia. See the Friends of A Dales High Way here, and read the background to the waymarking here. A new Inspirational video short, The Yorkshire Dales - when are you coming?, has been released by the Yorkshire Tourism Agency - Welcome to Yorkshire. It is one of three new videos about the region and is intended to be used by the regions tourist destinations to help promote the area. The videos were premiered at this year's Y12 - the biggest tourism conference in the UK, held last month at York's Barbican Centre and attended by over 1,400 people. It is estimated that there are 216 million visits to Yorkshire each year, worth £7 billion pounds. The Agency also unveiled it's new business plan. Gary Verity, Chief Executive of Welcome to Yorkshire said: "We have a five year plan to keep Yorkshire as high profile as ever and with the support of the industry and our patrons worldwide we will continue to ensure Yorkshire has a loud and credible voice on the global stage." See all three videos here. See Welcome to Yorkshire here. Bradford Council is to review controversial grouse shooting rights on Ilkley Moor. 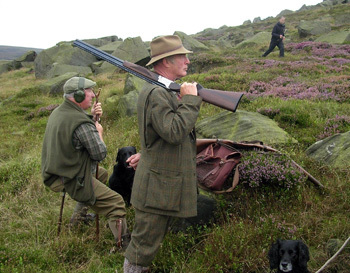 The shooting rights were awarded to the Bingley Moor Estate Partnership in December 2008, but there have been complaints from walkers about the behaviour of the Partnership's game keepers. The licence contains a clause which allows either party to end the agreement after five years, with six months notice. Edward Bromet of the Bingley Moor Estate Partnership, which also organises shoots on the adjoining Bingley and Burley Moors, said shoots took place for just six days last season, but the partnership carried out management on the moor 365 days a year. They pay the council £10,000 a year for the shooting rights. The Friends of Ilkley Moor, set up to help maintain, conserve and improve access to the moor, say they are unhappy with the way some dog walkers have been treated by gamekeepers, and have concerns about the land management work carried out by the partnership. The review, expected to be formally approved today, says councillors should consider "the economic aspects of the moor and the shoot", "the operation of the shoot and the interface between it and the public" and "the views of key agencies, representative bodies and users of the moor." An early stage of A Dales High Way crosses the moor, but sticks to rights of way which should be unaffected by the shoots. See our previous posting here, and the Friends of Ilkley Moor here. 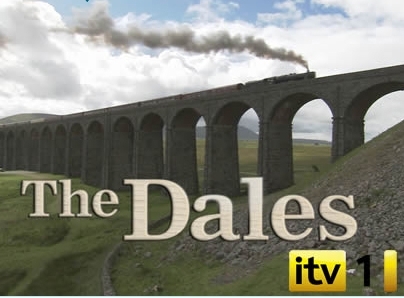 The popular ITV series The Dales is back for a second outing following its success last year. Presenter Ade Edmundson realised a childhood ambition by taking to the footplate of the Fellsman steam train as it headed north on the Settle-Carlisle railway, crossing Ribblehead Viaduct on the way. "I can't tell you how excited I am, if you're going on a steam train there's really only one place to be and that's on the footplate," says Ade. He revisits some of the people he met in the first series, including farmers Clive and Amanda Owen and their five children as they face another eventful summer on their remote farm in Swaledale, and pops in on mother and son farmers Carol and Phil Mellin who have set up a sheepdog training enterprise on their farm near Keighley. For Ade it's a return to the places he loved as a youngster: "I do like the Dales, I feel an affinity with them because they seem so familiar to me. I was born in Bradford, which is just on the border of the Dales, and we used to go into there a lot when I was a nipper - for days out and picnics and the like. It was where we used to go on all our school trips and as a teenager it became the place where me and my mates would go camping, hoping to get served in the pubs and meet girls..."
See our previous posting here, and catch up with the series on ITV Player here. A major exhibition of the important archaeological and geological discoveries made in Victoria Cave, above Settle, is to be staged in the summer. The cave was unknown in modern times, until an inquisitive terrier uncovered the tiny entrance on a fine May afternoon in 1837. Three weeks later, on the day Queen Victoria ascended to the throne, local plumber Joseph Jackson crawled into the newly uncovered cave entrance. Inside a wealth of Roman artefacts were found. Major excavations followed between 1870 and 1877, uncovering animal bones ranging from bear, lynx and red deer at higher levels, and hippopotamus, lion and elephant at lower levels. Evidence of the very first humans to live in the area has also been identified by local archaeologist and conservationist Tom Lord. The exhibition is being supported by a new project called Geo Dales, headed by the Yorkshire Dales Millenium Trust. The project will also create trails using rights of way around Settle, Greenhow Hill and Upper Nidderdale, focusing on geological and archaeological points of interest. In addition, local archaeologists will research ancient settlements around the Plantlife Reserve at Winskill and restore a historic limekiln. 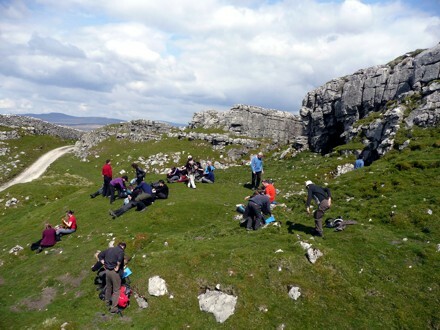 Urgent practical works and further research at Victoria Cave will also be supported by the Yorkshire Dales National Park Authority, Natural England, Winskill Farm visitor centre, caving club volunteers and universities. The exhibition will be staged at the Museum of North Craven Life at The Folly in Settle from July to October, and Tom Lord will be talking about the latest discoveries from Victoria Cave at St John's Church Hall, Settle, on Friday May 4th as part of the ride2stride Walking Festival. Photo: Tom Lord entertains visitors at his farm at Lower Winskill. 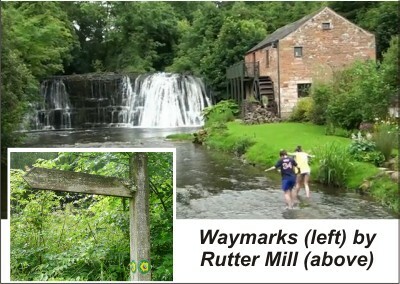 See Lower Winskill, the Folly, and the Yorkshire Dales Millenium Trust. The final programme for the new Settle-Carlisle Walking Festival - ride2stride - has been released, and promises something to please everyone. There are over 20 led walks from stations along the famous Settle to Carlisle Railway, ranging from easy 3-mile guided walks around Ribblehead Viaduct to a strenuous 17 mile hike from Hellifield to Settle. The walks are all free and there's no need to book in advance - just turn up at the start. Each is led by an experienced walk leader from one of a number of organisations who are involved in the Festival. There's music every day at different venues along the line, with some of the region's best folk musicians performing open sessions throughout the afternoons and evenings. Helping to round the festival off on Bank Holiday Monday is Dales Way author Colin Speakman, talking about Rambling and Railways - one of a number of talks through the week in Settle. The festival is being organised jointly by an ad-hoc committee representing a number of organisations including Friends of the Settle-Carlisle Line, Friends of DalesRail, Yorkshire Dales Society, SCENe (Settle-Carlisle Enterprise Network), Skyware Press, and the Three Peaks Folk Club. The festival starts on Tuesday 1st May with two walks leaving Settle Station at 09.50 (on arrival of the 08.49 train from Leeds). 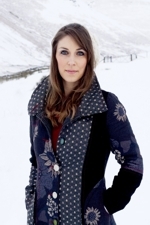 Members of the Three Peaks Folk Club will provide musical entertainment to launch the festival at Settle Station. The Friends of A Dales High Way are leading a walk on Sunday, May 6th, following the route from Langscar to Settle. Meet at Settle station at 10.10 a.m. to follow the Pennine Bridleway up past Jubilee caves along an easy walk to Langscar, joining the route of A Dales High Way back via Kirkby Fell and Attermire to Settle - 10 miles. (PLEASE NOTE: These details have changed since originally published, due to changes in the bus timetable. The original plan was to catch the Dalesbus to Malham and walk back passing Malham Cove, Kirkby Fell and Attermire Scar). Walk leader Chris Grogan said: "This is one of my favourite sections of the route and a great chance for walkers to get a taste of A Dales High Way. We're really pleased to be part of the ride2stride festival. It's going to be a fantastic week." For the full programme see the ride2stride Festival website here. Explore the glorious high country of the Yorkshire Dales - by train! A new walk guide from the authors of A Dales High Way is published this month and offers 32 day walks from stations along the world famous Settle-Carlisle line, the most beautiful railway in England. Dales Rail Trails covers 18 circular routes from stations along the line from Settle to Kirkby Stephen, each between 6 and 13 miles long, with a further 14 linear walks from station to station. There are 22 full colour maps at a scale of 1:25,000, with concise descriptions of the routes and places along the way. Taken as a whole they provide a comprehensive coverage of the area of the western Dales along the railway. Co-author Chris Grogan said: "You can reach the heart of this fabulous walking country from Leeds, Bradford or Carlisle by train in little over an hour. Better still, why not enjoy a walking holiday by basing yourself at a village on the line and use the train to explore the stunning western Dales. "We've been planning this book ever since we finished work on the two Dales High Way guides. All those people who enjoyed the long-distance trail and have thought about returning to the area to explore this beautiful landscape further, will find this book fits the bill perfectly." The book also includes a guide to the popular 24-mile Three Peaks Challenge Route, and for lovers of long distance walking there are details of the 48-mile Six Peaks Trail, which links stations from Settle to Kirkby Stephen. There's additional supporting material online, including outtakes - outlines of walks that didn't make it into the final book. The Dales Rail Trails project received financial backing from the Yorkshire Dales National Park Authority's Sustainable Development Fund, and a proportion of the proceeds from the sale of each copy will be donated to the Friends of the Three Peaks, to help improve and maintain the footpath network in the Three Peaks area. So, as they say, let the train take the strain while you enjoy the walk. See more details of Dales Rail Trails here. Buy a copy online from Skyware Press. The arrival of the Olympic Torch in Skipton this summer will be cause to celebrate for many, but will inadvertently add to the funding worries of local Mountain Rescue organisations. The arrival of the Torch on June 24th from Manchester, passing through Bradford and Skipton before heading to Leeds, has meant that the annual Broughton Game Show has had to be cancelled. This in turn means that both the Upper Wharfedale Fell Rescue Association (UWFRA) and Cave Rescue Organisation (CRO) will miss out on more than £20,000. The Broughton Show is a major fundraiser for both groups. David Aynesworth, Chairman of the show committee said "With lots of family events being planned for the town centre, we felt this would have a massive affect on show attendance, particularly as this event will draw people from many surrounding areas". 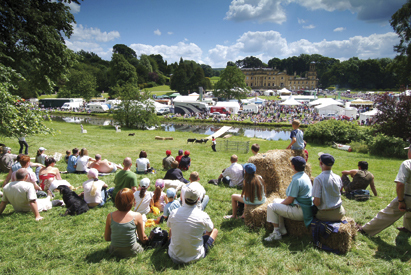 Paul Jackson, editor of the Dalesman magazine which sponsors the Broughton Show, said "It's a great shame that people will miss out on what is a quirky and enjoyable day but I understand that being part of the torch ceremony is for most people a once-in a lifetime experience. "The volunteers are the big losers, so I hope people who would normally attend the show will go out of their way during the next twelve months to support the teams' other fundraising events"
Since the first show in 1979 around £300,000 has been raised for the two groups. 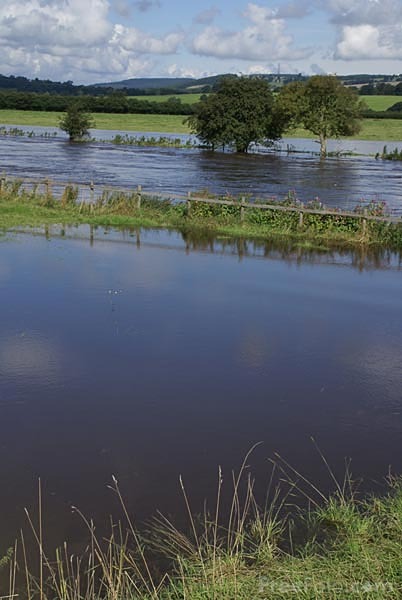 It has only been cancelled twice in the past - in 2001 because of Foot & Mouth and in 2009 after flash flooding. Both groups are hoping alternative fund raising efforts will help plug the gap this year. And both teams reiterate that they will continue to provide the rescue service, wherever and whenever it may be needed. See the Broughton Game Show website here. Find out about alternative support for the Upper Wharfedale Fell Rescue Association (UWFRA) and the Cave Rescue Organisation (CRO). See the Olympic Torch route here. The year long experiment of having an "Artist in Residence" on A Dales High Way has ended in triumph with almost all the new paintings sold. 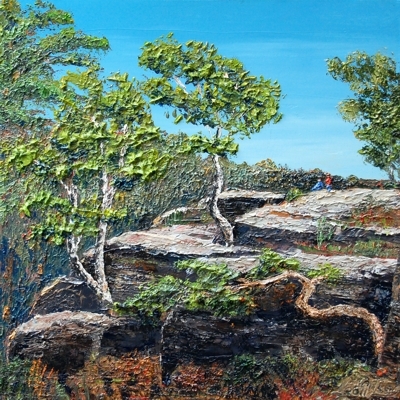 Of over 30 oil paintings produced through the year and exhibited in art galleries along the route, from Shipley to Penrith, only a handful remain. Saltaire artist David Starley, who came up with the idea of the year long Dales High Way Art Project at the end of 2010, agrees he's had a great year: "The painting has been both challenging and creatively stimulating, but with results that exceeded my expectation." David works in oils, creating fabulous, textural paintings - great big canvasses with the paint layered on to create a sculptural surface which changes constantly as the light moves across the scene. Excited by the possibility of creating an exhibition themed around the route, David spent the year walking sections of the trail with his camera and sketchbook, returning home to create his paintings. Paintings inspired by the varied landscapes he experienced, from the bleak moorland of Rombald's Moor to the flower-filled meadows of Dentdale, the dramatic limestone scenery of Malhamdale to the richly wooded riverbanks of Hoff Beck. Paintings which transform the views into pieces of art. The Project maybe over, but the paintings remain as a lasting legacy of the power of this landscape to inspire and to thrill. See our previous post here, and see the results of David's Dales High Way Art Project here.